www.photomacrography.net :: View topic - Video, ciliate predation: theft, ingestion, digestion. IDs? 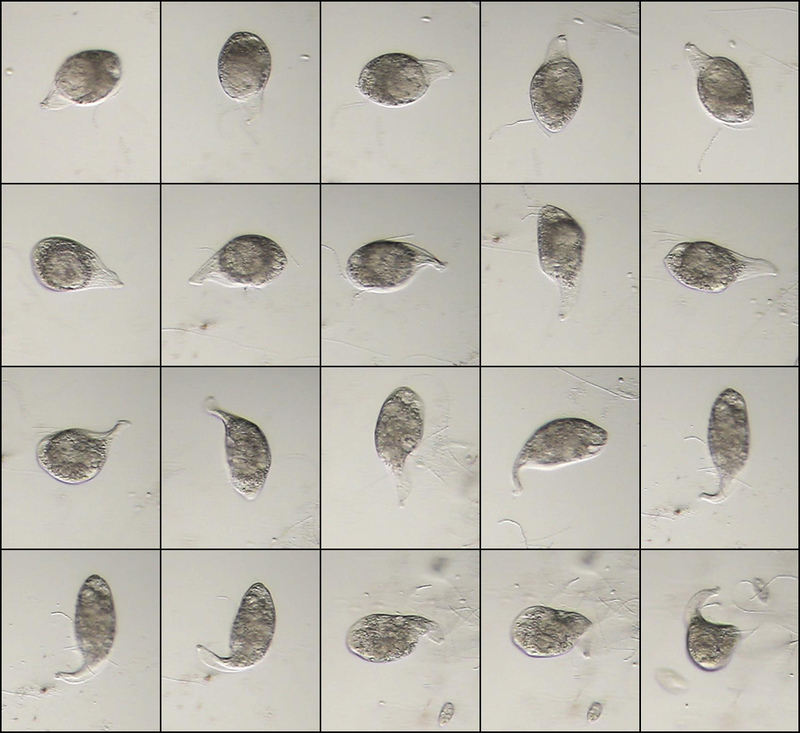 Video, ciliate predation: theft, ingestion, digestion. IDs? Posted: Sun Feb 19, 2017 1:11 am Post subject: Video, ciliate predation: theft, ingestion, digestion. IDs? This was a lucky catch. 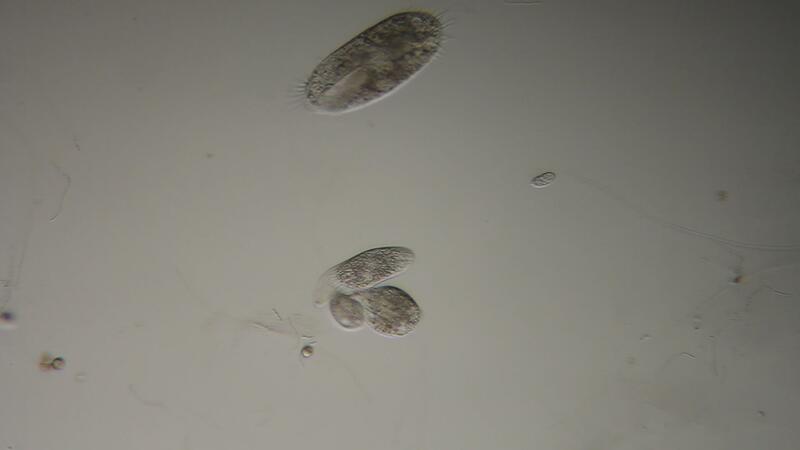 The video begins with some large predatory ciliate having captured some smaller ciliate, apparently preparing to eat it. 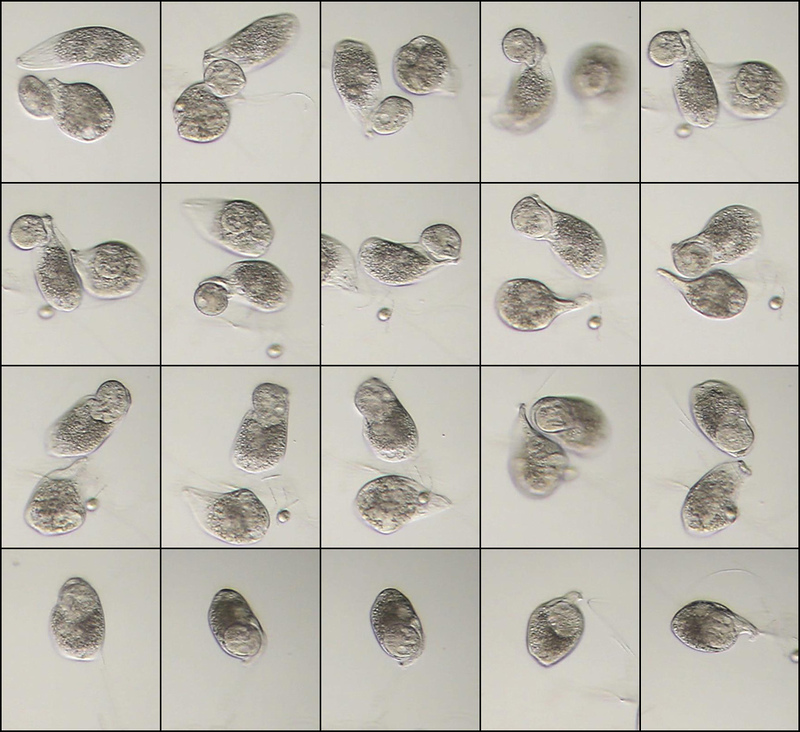 In the first 15 seconds of the video, a second large ciliate intercepts the first one and wrestles away the prey. At about 0:20 and continuing through 0:45, the large ciliate successfully ingests the prey, losing its membranous front end and assuming a fat oval shape with no projections. At that same time, the first predator leaves the scene, apparently figuring there's no longer any chance of a meal here. Processing of the prey and resumption of more normal shape continues through 1:00 (5 minutes of observation). From there through the end of the video (2:18, another 6 minutes real time), the predator gradually finishes processing its meal, regains its normal structure, and starts sniffing around for something else to eat. Shot with a 20X objective, cropped and scaled in post-processing to about 0.53 mm field width. Each of the panels shown below is about 140x160 microns. If anybody has an ID for the participants in this little eco-drama, I will appreciate knowing. The predator has two macronuclei and a slit mouth, and is clearly pleurostomatid (not a tracheliid or dileptid). The posterior contractile vacuole is conpicuous, but it's hard to be sure whether there is a second one in mid-body. It very much resembles Litonotus varsaviensis, as redescribed by Foissner et al, in the fourth volume of their "ciliate atlas", 1995. I can't say anything about the victim. Were you using AmScope achromat objectives and matching eyepieces (if any)? I found CA colors pretty low, for what they are. Did you digital desaturate/remove CA colors? All, thanks for the comments! Bruce, many thanks for the ID. If I have time, I'll try to catch some better shots. What parts of the anatomy would you particularly like to see? zzffnn, this particular objective is one that I bought ages ago at Edmund Optics. It's a basic achromat, which I selected at the time because it had barely enough working distance (3mm) to use for macro stacking. I swapped it into the Amscope turret to get a nice sequence 4X, 10X, 20X, 40X. The speeded-up video did have some brightness/contrast/color adjustments, which interact with each other in ways that I don't fully understand. So to answer your question I have extracted a single frame from the video (using Camtasia) and saved it out to HERE with no further processing. It does seem to be pretty low CA. It would help to know exactly how many contractile vacuoles there are (assuming there are more than the posterior one we see here), and to have a close look at the mouth area, along with any associated structures, such as extrusomes (which appear as small rods perpendicular to the mouth slit). As always, with ciliates, the more you can see of the body cilia, the better. These are arranged in long rows (kineties), which can be counted.